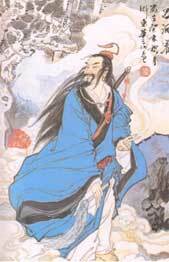 In Taoism, he is known as Zheng Yang Ju Shi, 正����. Literally, the True Yang First Master. 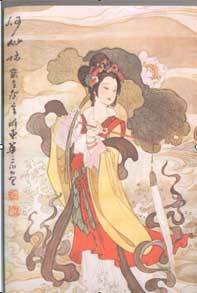 He is the Chief of the Eight Immortals, is said to have lived during the Han dynasty and have possessed the secrets of the elixir of life, and the power of transmutation. 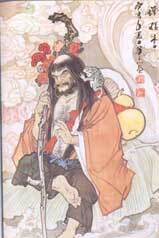 He is also known as Zhongli of Han (�h��x) because he was born in the Han Dynasty. He is usually depicted as a fat man exposing his bare belly, always grasping his emblem, a fan, which has the magical ability of reviving the dead. 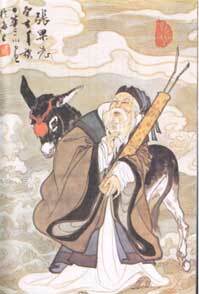 Elder Zhang Guo, lived during the 7th and 8th century AD is a hermit who had spiritual powers of magic, i.e. rendering himself invisible, He is accompanied by a white mule, which carried him immense distances and when not, required was transformed into a paper mule, folded up and put away in his pouch. When he wished to resume his travels, he sprinkles some water upon the paper mule revived it and the mule will appear at once. He generally rode his mule backwards. His emblem is the “Yugu” (�~故), a kind of musical instrument in the shape of bamboo tube or drum with two rods to beat it. 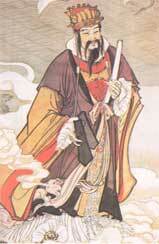 He is the nephew of Han Yu �n愈, a famous scholar and statesman who lived during the Tang Dynasty (AD820). 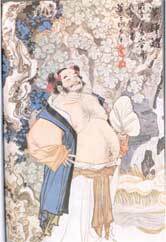 He is the disciple of Lu DongBin, he became an immortal when he fell into a supernatural peach tree. He has the ability of making flowers grow and blossom instantaneously. 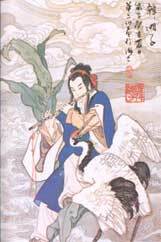 His emblem is the flute, and he is the patron of musicians. 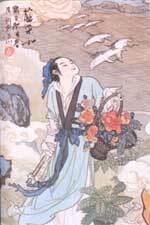 He wanders around, playing his flute, enticing birds and beast of prey by the sweet melodious sound of his flute.